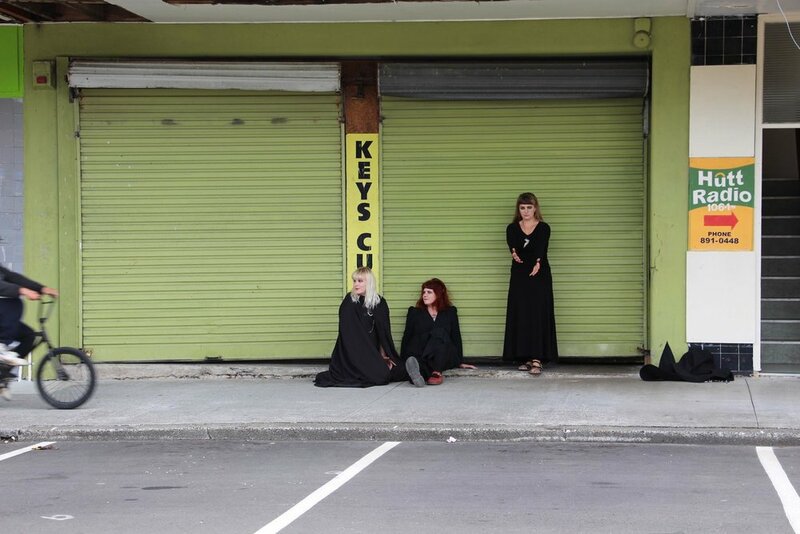 Wellington-based trio, HEX reflect the chaos approaching post-capitalism, with heavy drums underpinning intricate guitar riffs and dual vocals. They bring their sharp, anthemic, wholly unapologetic and raw pagan-punk to Australia for the very first time. If you don't believe us, the famed Lachlan Kanoniuk recently gave "Pages of Pentacles" Single of The Week while noting, "caught them over New Year’s and they’re even sicker live – they’re hopping over the ditch for a shitload of Melbourne shows this April, you’d be an egg to miss out". Birthed in 2015 from a musical lineage that spans classical to folk to punk to metal, the trio of Liz Mathews and GG and Kiki Van Newtown have already graced the stages next to Acid King, The Kills, and Dinosaur Jr.
HEX’sraw and fierce act, and their take on love, life, community and politics has seen them carving out a mode of connection outside of traditional rock’n’roll tropes as they move methodically between harmony and discord with tempo shifts and interweaving melodies devolving into psychedelic breakdowns before drawing together in resolve. “Pages Of Pentacles” follows on from “The Moon” both taken from the trio’s debut LP, out later this year.